Another iteration of my Lian Li benchtable, this time watercooled. Idea was to move all noise generating parts away from the pc, and still have hardware exposed for aesthetic purposes. Big 9x120mm radiator and D5 pump attached to it (all through vibration isolation). Not all fan slots are populated as there is simply no need, pump also can run @ low gear, high flow doesn't really make enough difference to make a difference. Fans (enermax magma), are turned off by default, speedfan launches them based on gpu temp sensor, they operate @650 rpm, and go up with temp increase, but because temp can't really go up past 42-43C on gpu, they just stay at minimum speed. Radiator is about 3 meters away from PC, and slightly blocked by furniture, from that distance it is completely inaudiable in blind test. PSU inside case is seasonic fanless. Of course there is still coil whine during load from pc components, so whole rig isn't entirely silent. Advantage of that setup is, that it is very easy to clean, as there is no heatsinks and fans on top of bench case. There is no fans to accelerate dust buildup inside heatsinks that are more difficult to clean. Fans mounted on radiator are turned off 99% of the time, there is hardly any dust there, even after almost a year of operation. Overall I'm really happy with this version. It has all the advantages of watercooling (great temps, possibility scale up radiator size and get away with extremely low fan rpm) and elimiates its flaws (cancels pump noise/vibration by moving it away from the setup, isolating it from the computer case that tends to vibrate, also there is no issue with computer case ruining the airflow for radiator, same surface of radiators, inside of quiet pc case, their performance is greatly diminished by blocked airflow). And on top of all that I get to see hardware better than in any windowed case, benchtables are impossible to beat in that area, as everything is exposed from every angle. In comparison to same concept but aircooled, this one is also much easier to clean, as you don't need to deal with dense heatsinks being clogged with dust, that you can't really comfortably vacuum without unmounting fans to get better access to heatsinks. 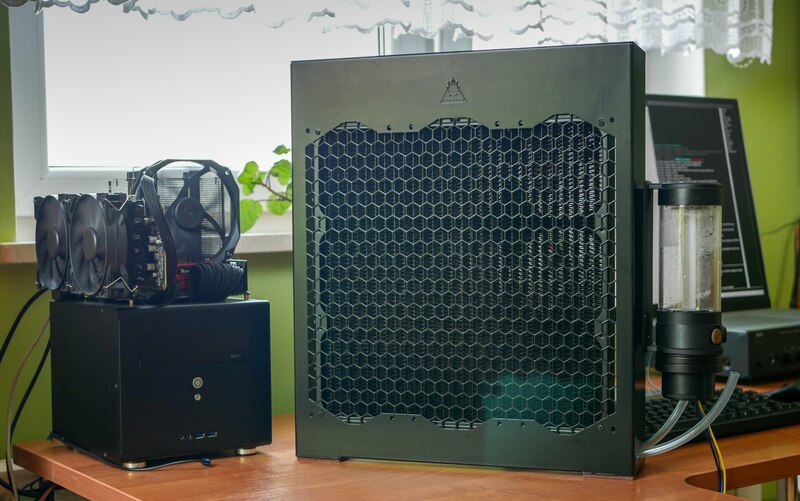 Really like the build, i always wondered about external rads, seems a very viable option, i would like to do one but with quick disconnects.... someday. I use vario (5 gears), you can't dail it down as low as PWM version does. Key is proper vibration isolation. I ended up using different reservoir, that is not mounted to the radiator stand, it is placed next to it on the foam padding (its hidden so aesthetics are not that important). That xspc one from the pic, res-pump combo was giving trouble to get rid of vibrations, whole thing after some time started resonating. If pump is on lowest gear, completely suspended on foam, no hard mount to anything, it is very quiet, you need to try hard putting ear at around 50cm to start detecting sound. From distance I sit from it, it is completely inaudiable. 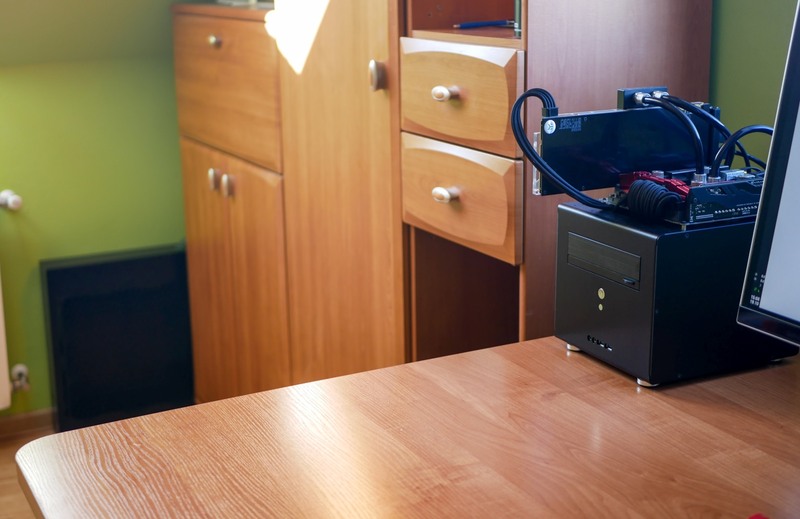 But if you wanted to use it inside PC case, on top of your desk, and with some sort of hard mount to the case frame, I wouldn't recommend, not spcr standard. As for quick release fittings, they are quite expensive, I ended up using just two-side barbed fittings, so that I use cheap 5m tubing from pump/rad to case, and expensive better looking tubing near the PC. But I found that I will not be moving this anyway, so spending extra on quick connect fittings will be just waste of money, so far it checks out, didn't have need to move the rig. Also I left some slack onm tubings, there is loop thats hidden under cabinet, so If i want to move the case within the desk, for cleaning or some maintenance, I have enough excess tubing to move it over a meter in any direction from where it currently stands. Do you know if the PWM version is quieter because it could go lower? Thanks for the info, really encouraging, although i have to research, i havent found that much info about suspending the pump, but im really interested since its inaudible. 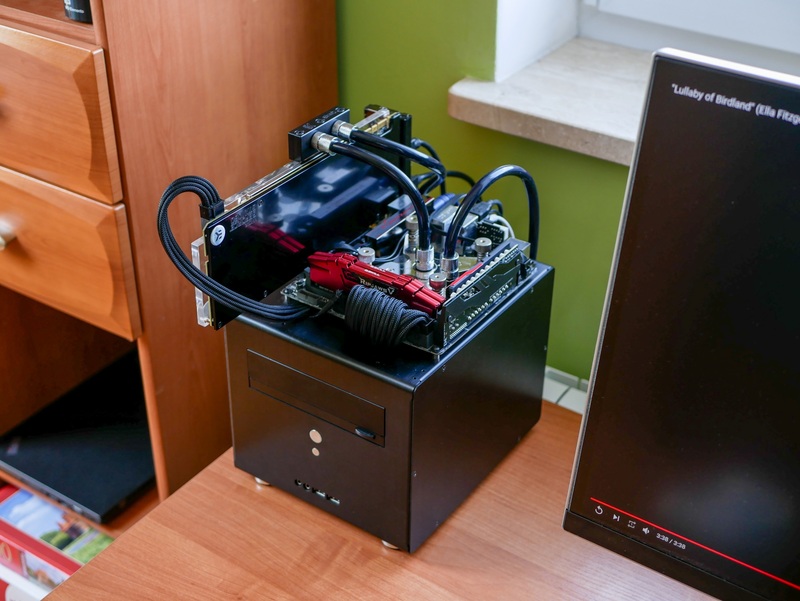 Im planning something weird, i want to build a test bench that will be inside an treated room, but i want to have the Rad + Fans + Pump in another room, to test GPUs, this is why i want to have some quick disconnects, as the bench will not always be up, but i want to do some hard tubbing from room to room and soft with quick disconnect inside the treated room, this is the main reason i liked the rad you showed. PWM version od D5 should be quieter because it can go lower rpm, just like fans do. Also you are more flexible with controlling it, you can adjust exact speed that you want or even make it speed up during load to increase flow. WIth vario pump, there is dial at the back of pump so you basically set desired speed once and not tinker with it anymore, as it is pretty hard to access it. Does the PWM version have any downsides or is it straight up a better solution?